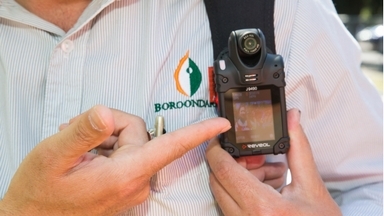 Council’s parking, animal management and local laws officers wear body cameras for their safety and wellbeing. The cameras also benefit the community by collecting better evidence and helping prevent anti-social behaviour. The body camera is attached to an officer’s uniform and is clearly visible to everyone. We are committed to protecting your safety and privacy. private dwellings. Officers may use the camera on private property with the permission of the property owner. We will ensure that any personal information (footage) captured is protected from misuse, loss, unauthorised access, modification or disclosure. All personal information will be destroyed or permanently de-identified when it is no longer needed for any purpose. If you believe one of our officers has inappropriately used a body camera, you can contact the Manager of Local Laws on 9278 4444 or email Council. You can request access to footage containing your personal information under the Freedom of Information Act 1982. See Freedom of Information for details. This initiative began in November 2017 in response to the increase in occupational violence that our officers are facing while doing their jobs. We undertook a comprehensive due-diligence process and significant planning before introducing body cameras into operation, including benchmarking, developing a policy, conducting a trial and training.